NEWS! 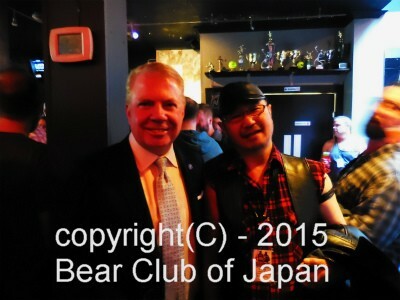 Our club president had a handshake Mr. Ed Murray - Mayor of the city of Seattle, WA, USA at "Spring thow" by Northwest Bears, kick start event at Diesel Bar, Capital hill. He is one of aggressive political leader of LGBT community in the U.S.
We want meet & talk to the world BEARs! This English Service is now in down town Tokyo only. We can give you some of information - sight seeing place, shopping area and gay area. We can arrange to meet you. Enjoy dinner or drink at great Tokyo with us. WE ARE NOT COMMERCIAL SERVICE, ITS FREE WORKS BY BCJ VOLUNTEERS. UK, France, Spain, Austria, Australia, Spanish, Turkish, Norway, Netherlands, Germany, Taiwan, Slovakia bears. 1996, 1998, 2000, 2005, 2007 International Bear Rendezvous (San Francisco, CA) by Bears of S.F.